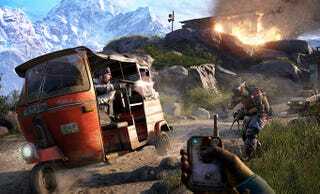 A couple of lucky streamers have the chance to play Far Cry 4 before the game is actually out. Hopefully this doesn't make you feel too jealous, because we all have a chance to watch them play it live on Twitch. What sorts of hijinks will they get into? I'm hoping it involves elephants and gliders, both of which look like really exciting aspects of the game. The suushisam livestream for Far Cry 4, embedded below, starts at 2PM PST.